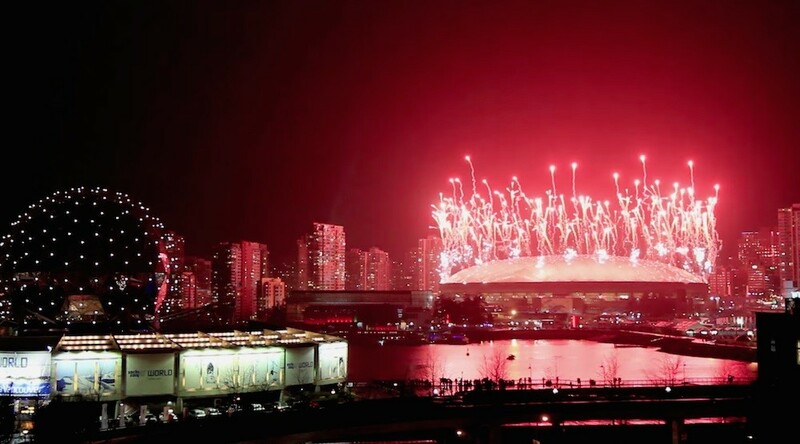 There is no question the 2010 Olympic Winter Games were the equivalent of Expo ’86 for the city’s newest generations. It changed Vancouver forever and gave us a greater sense of civic and national pride, leaving us with enduring collective memories of the brilliant celebrations in the streets, at the city arenas and on the slopes of Whistler. With tragedy and triumph, the 17-day event from Friday, February 12 to Sunday, February 28 unfolded like a storybook. It began with heartbreak: the death of Georgian luger Nodar Kumaritashvili and the battle of keeping Cypress Mountain’s venues covered with snow cast a shadow of uncertainty of what would follow. 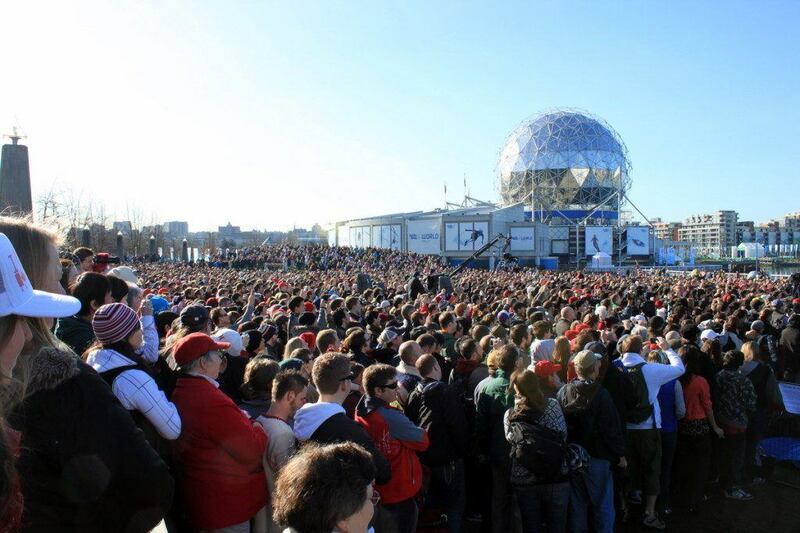 But in the end, the Games turned around with Vancouverites embracing the event like no other Olympic host city has done before. The host nation won a record 14 medals, including the medal haul topper of winning the Men’s Ice Hockey Olympic championship – the final event of the Games. Note: Some of the following YouTube videos are by the International Olympic Committee and can only be played on YouTube. Carried by 12,000 torchbearers, the Vancouver 2010 Olympic Torch Relay covered a 45,000 kilometre long route across Canada over a short span of just 106 days. Millions of Canadians lined the streets in anticipation of the Games, with the 45,000 kilometre long domestic route beginning at Victoria then making its way to the Canadian North and the East Coast before crossing the prairies to return to B.C. Throughout its journey, the torch travelled on canoe, surfboard, snowmobile, horse and buggy, snowplow, mountain bike, skis and snowboard. Local snowboarder Jonny Lyall slid into BC Place Stadium in spectacular fashion for the welcome segment of the Opening Ceremony. Lyall was among the two riders (one as a backup) selected to perform the stunt. A coin toss the day before the Ceremony cemented his role in the three hour ceremony. Last but not least… The announcers were barely audible when Team Canada walked into their own party during the Opening Ceremony’s Parade of Nations at BC Place. At every Olympics, it’s always a highlight for the host country, which walks into the stadium last. Canadian hockey great Wayne Gretzky lit up the permanent Olympic Cauldron at Jack Poole Plaza which signalled the start of the 17-day long event. This was followed by a surprise eight minute fireworks display launched from a barge in Coal Harbour. Two sets of massive Olympic rings were installed in the middle of Coal Harbour in downtown Vancouver and just outside Vancouver International Airport. With the Coal Harbour rings, the fixture glowed gold whenever a Canadian athlete won a gold medal. In fact, by closing day on Sunday, February 28, the rings glowed gold a total of 14 times (“We’re number one!”). 6. The first home gold! There were no home golds at the Games of Montreal and Calgary. But at Vancouver on Day 2, Alex Bilodeau gave his country its first Olympic home gold with a top performance in the Men’s Freestyle Skiing Moguls up at Cypress Mountain. North Vancouver-born Maëlle Ricker won Canada’s second home gold on Day 4 in the Ladies’ Snowboard Cross at Cypress Mountain. 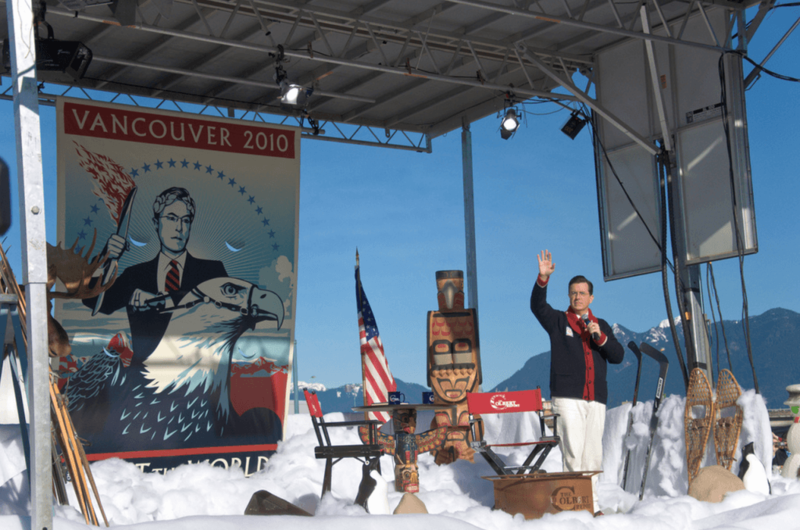 For Vancouverites, one of the fondest memories of The Colbert Report‘s nine-year long run was likely when Stephen Colbert made a visit to Vancouver during the 2010 Olympic Winter Games to record a week’s worth of episodes for his show. “It’s 11:30 at night and the sun’s still shining – and they wonder why there’s no snow here,” Colbert shouted while recording the show’s opening. How do you celebrate a gold medal win? Moments after winning Olympic gold in the Men’s Skeleton Final Event, Jon Montgomery celebrated his big win by chugging a pitcher of beer given to him by a spectator. Canadian figure skater Joannie Rochette put aside the personal tragedy of her mother’s sudden passing on February 21 at Vancouver General Hospital, just two days before she was scheduled to compete. With the support of Canadians and viewers around the world, she entered into the Ladies’ Singles competition and finished with a bronze medal. Yuma Kim of South Korea took her routine to a new level in 2010, creating a new international benchmark for the Ladies’ Singles figure skating event. She has broken world record scores eleven times, including at Vancouver where she won Olympic gold with a new world record that was 18 points above her personal best and own world record. Ice dancing duo Tessa Virtue and Scott Moir at Vancouver melted our hearts in Vancouver. They also provided us with an incredible example of friendly competition, training with the United States’ Meryl Davis and Charlie White at the same Michigan ice rink with the same coach. The Canadian duo went on to win gold while the Americans finished with silver in a discipline usually topped by Russian skaters. Another gold at Cypress Mountain: On Day 11, Vancouver-born Ashleigh McIvor won the first ever Olympic gold medal for the Ladies’ Ski Cross event. The Canadian women’s hockey team defeated their American counterparts 2-0 in the gold medal game held at Canada Hockey Place (Rogers Arena). When the crowds left, some of the players returned to the ice and celebrated their win by drinking beers and smoking cigars with medals around their necks. Unfortunately, it became a faux controversy after it caught the attention of the International Olympic Committee, which led the team to issue an apology. Charles Hamelin won gold after taking the lead in the Men’s 500m Short Track Speed Skating Final at the Pacific Coliseum after South Korea’s Sung Si-Bak stumbled and crashed in the final lap. Teammate François-Louis Tremblay won bronze after American skater Apolo Anton Ohno was disqualified for pushing. We could show you the highlights of his race, but the reaction of his girlfriend and Team Canada teammate Marianne St-Gelais was far more entertaining. Approximately two hours after his first Olympic gold medal in the Men’s 500m, Charles Hamelin led Canada’s Olivier Jean, Francois Hamelin, Francois-Louis Tremblay and Guillaume Bastille to claim a team gold medal in the Men’s 5000m Relay Short Track Speed Skating Final at the Pacific Coliseum. The Men’s Ice Hockey final had an average audience of 16.6-million, meaning nearly half the Canada’s population watched the highly anticipated gold medal game between the home team and the United States. A total of 26.5-million people or 80% of the country’s population watched a part of the match, which ended when Canada’s “golden boy” Sidney Crosby scored the winning goal at 7:40 in overtime to defeat the Americans 3-2. The entire city erupted in cheers and celebration when Crosby gave his gold medal game winning goal on the American net. This is what unfolded in the streets of Vancouver… to the extent that all three False Creek bridges into downtown Vancouver had to be shut down to prevent vehicles from entering. There was so much to see and do in the streets of Vancouver; for 17 days, this city was anything but a “No-Fun-City.” Everyday during the Games, tens of thousands of people flooded the streets of downtown to watch the events, take part in the many activities and exhibitions, and celebrate wins. Canadian pride and hospitality had reached a fever pitch, leading IOC president Jacques Rogue to deem Vancouver 2010 as an “excellent and friendly” during his address at the Closing Ceremony. … with nightly concerts and fireworks at Live City Yaletown. … with an incredible ‘Vectorial Elevation” light display at English Bay. … with so many pavilions, attractions and activities, including the free zip line at Robson Square! There’s no question that the Olympic Cauldron malfunction during the Opening Ceremony was one of the Games’ most embarrassing moments. To rectify the malfunction, Ceremonies producers David Atkins Enterprises changed the show’s opening sequence by having a clown dressed as a handyman climb up from the stadium floor to “pull” up the missing fourth leg. As the leg was rising, Olympic speed skating champion Catriona Le May Doan – the torchbearer who was unable to light her leg – was lifted up onto the stadium floor through a trap door to complete a flawless relighting of the Cauldron for the Closing Ceremony.